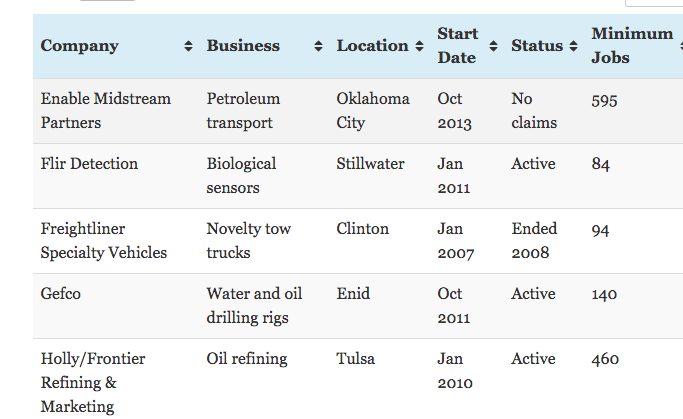 Nine companies have qualified for Quality Jobs payroll subsidies since Oklahoma began providing payments for existing jobs in 2006. This table, based on data collected by Mark Lash, a retired federal agency program manager, summarizes all payments made as of Feb. 13, 2015. “Minimum jobs” is the number of existing jobs companies are required to maintain to continue receiving subsidies. In some cases, actual payments and job counts have exceeded those amounts. Sources: Oklahoma Department of Commerce, Oklahoma Tax Commission. The “change-in-control” provision started eight years with a spinoff of Kerr-McGee Corp.